The cookbook with the most stains in my collection is also the first one I ever bought: a copy of the 45th printing of the 1975 Joy of Cooking. It helped me survive my teen years, and then it helped me graduate from college with a bit more meat on my bones. I never did upgrade, and that white bible of the American kitchen (complete with its two silky red ribbons) is still my go-to tome for pancakes, muffins, cakes, pies, dinner rolls, dressings, and quick breads. I’m still discovering new foods in its pages. 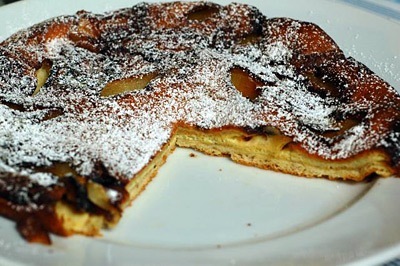 A recent addition to our family favorites is a Tran variation on a Rombauer adaptation of a Davidis classic: German pancake with apples. This 1970s commercial shows how to make a big production out of soup. Ann Miller was a much-loved dancer who was discovered before she even hit puberty right here in San Francisco at the historic and colorful Black Cat Cafe. Eat your heart out, Ann Miller!